Don't miss Acer Predator at PAX West 2018! Catch the Predator team as they meet attendees on the show floor with cosplayer Arcanine Rawr, hand out exclusive swag, engage with a special AR experience, and give away VIP passes to the party. Follow #PredatorPAX closely on Twitter for regular updates on where to find them, and interact with the Predator AR experience on the show floor for a chance to win a Predator Orion Battle Station worth $10,000! 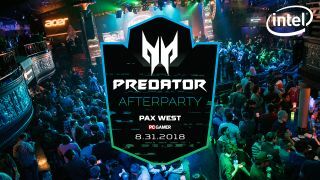 When you've finished walking the show floor at PAX West 2018 be sure to come by Acer's Predator Gaming After Party at The Showbox on Friday, August 31 at 9 PM. It will be a night of music, games, and giveaways. Watch DJ A-TRAK perform live on the Showbox stage, play competitive games of Rocket League in our pro-style 4 vs 4 matches, grab a drink, and enter the night's giveaways to win prizes like the powerful Predator Triton 700 gaming laptop and more. Post your best tweet at the party with #PredatorPAX for a chance to win! Register here and join the party!